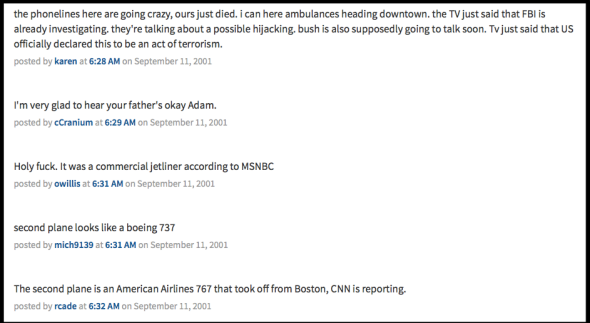 What If We’d Had Social Media on Sept. 11, 2001? Actually, We Did. There was no Facebook or Twitter in 2001, but there were online forums like Metafilter. Social media have changed how we experience earth-shaking events. Facebook and Twitter are first stops for the media, newshounds, people trying to connect with loved ones who might be affected, and people on the ground reporting what they see. The patterns by which information, misinformation, analysis, shock, and grief spread on social networks are by now so familiar that it’s easy to forget how recent the phenomenon is. On Sept. 11, 2001, there was no Facebook, no Twitter, not even a MySpace. There was barely a Wikipedia. Googling was not yet a familiar verb. Web 2.0 was not yet a buzzword, let alone a cliché. Instead, the world watched the events and their aftermath unfold on television and exchanged personal news by telephone, email, and word of mouth. For better or worse, most of the platforms that today lend public megaphones to private individuals were absent on the day that shaped history more fatefully than any other in the 21st century so far. Most—but not all. As journalist and author Steve Silberman reminded us Friday on Twitter, there was at least one prominent online forum that lit up 14 years ago in ways that presaged the social media explosion to come. 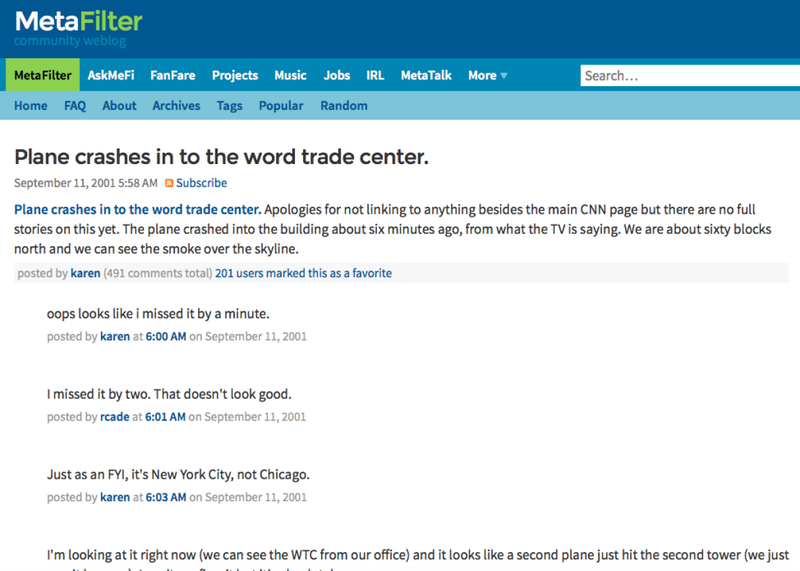 “Exactly” might be an overstatement: The Metafilter thread that took shape in the minutes and hours after the first plane hit the World Trade Center was drawing, at its peak, a few comments a minute. In contrast, global news events today can spark upwards of 500,000 tweets per minute. Still, to reread this thread today—matter-of-factly titled “Plane crashes into the world trade center.”—is to relive the events of Sept. 11, 2001, in a fresh way, at once more raw and detached than archival news footage, photo galleries, or newspaper stories. It’s a document that tell us as much about the way social media color our experience of world events as it does about the fateful day in question. Twitter didn’t invent confusion, commiseration, or misinformation. Jumbled facts, disbelief at the truth, credulous reporting of false rumors, commiseration, wild speculation, ill-timed political commentary, and partisan name-calling: It’s all recorded there for posterity, just as it is today on Twitter every time something terrible happens in the world. “New news… there was a car bomb outside the state department,” a user with the handle “dogmatic” reported at 7:36 a.m. “ABC is denying the car bomb at the state dept.,” a user named “bison” corrected nine minutes later. If Twitter is a hoax factory or a truth machine, then so was Metafilter. And if Metafilter was, then surely, so was whatever media we used to share news online before that (Email chains? Phone trees? ), and offline before that (word of mouth). And if today’s social media highlight the worst and best of human responses to tragedy and triumph, it isn’t because they’ve altered human nature. They’ve just made it more searchable.